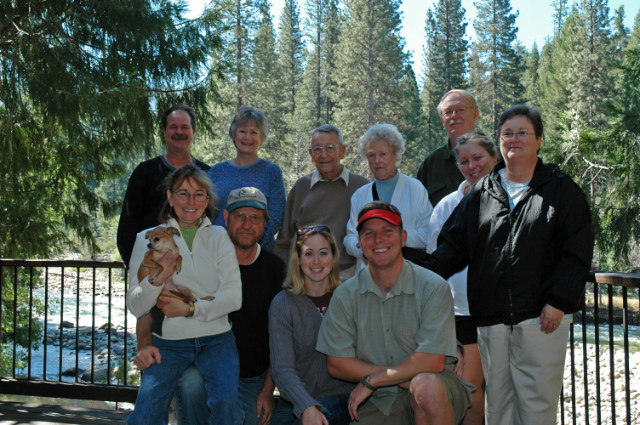 This past weekend all of Shannon's family and I got together at Wawona in Yosemite for a family reunion. We had a blast. 19th - Me, my Dad, and the Burton men went into the park for picture taking and hiking, then later that day we had dinner at the Wawona. Late that night, we went up to Glacier point for night photographs. 20th - A visit to Mariposa Grove of Giant Seqouias, and we were full. You can see a gallery of all of the action here: http://hurstdog.org/pictures/BurtonYosemite2005/. Everyone is really excited for next year, and we're trying to figure out a good place to go as we speak. What lovely pictures from your trip to Yosemite! I especially like the family picture. You should enlarge that one and frame it. Itt's great to have a family picture where everybody looks good. This is a keeper. Your trip sounded fun. I miss our fmaily trips now that my Mom and Dad are gone, and my brothers are so far away. Enjoy eachother while everybody is still here. You just never know what the future will hold. Family trips are what memories are made of, and they can never take them away. Enjoy every one of them. Andrew - the photos are wonderful (as usual). What a Great Housewarming BBQ!